Humanity looks to the Gregorian New Year as a sign that things will get better. Of course, then we realize how stupid that is when we wake up in the New Year with the worst hangover since last St. Patrick's Day and/or Cinco de Mayo. Every year, I choose the four men, women, organizations, and/or weather patterns that gave us another shove toward Revelations. And it's funny, 2005 was starting to look like the number of the Beast... which just, on a side note, makes me wonder how many Christians back in 665 A.D. expected New Year's to be the end of the world. This year had so many choices. Everyone was clamoring to their spot on this list. Even Michael Jackson, after a year's absence, made a run. However, he didn't quite make it (which might be a sign of the Apocalypse in itself). Instead, another girl made herself the leader of the Horsemen in one fell swoop/hurricane season. Because who did more damage than Mother Nature herself? Gaia whacked the crap out of Indonesia right before the end of last year, giving that country a whole lot to do for 2005. And everyone reading this, I can imagine (besides several web-surfing programmed bots that have no emotions) can think of Hurricane Katrina, bringing New Orleans, one of the jewels of the United States, and the rest of the Gulf Coast to a standstill. Don't forget how many hurricanes actually came about in the Atlantic/Gulf. We made it to Epsilon (number 14). And did I mention it's thunderstorming outside my house as I write this? Mother Nature, I name you Death, my Horse(wo)man. In a less depressing choice, my Horseman of War: a war is coming... North and South, brother against brother, the rematch. But it's not what you think, unless you live in Chicago. Then you know exactly what I mean. North Side, South Side. Cubs, White Sox. And what all started this? Ozzie Guillen, the manager, winning the White Sox a World Series. And what does this mean for the rest of the world? The alignment of Major League Baseball's World Series into one Apocalyptic moment has begun. To explain: the Cubs won their last World Series in 1908. Then got cursed. The White Sox won their last Series in 1917, nine years later. Then got a Black Sox scandal. The Red Sox won their Series in 1918, a year later. Then got cursed by a Bambino, whatever the heck that is. Like a rubberband, it is coming back. The Red Sox won and broke their curse; the White Sox won the year after (this year), living down the Black Sox scandal. God help us when the Cubs win in nine years, completing the cycle and causing the Rapture. Jesus will want some peanuts and crackerjacks, so save him some. 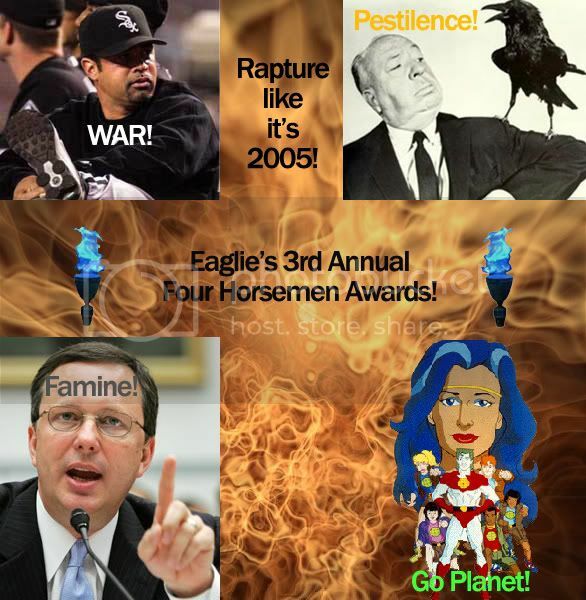 Goddamn you, Ozzie Guillen, the Horseman of War, for being good at what you do. Pestilence was not a tough choice. Who didn't cheer for Avian Flu to get this award? Yep, we actually had a plague this year, looking to go Biblical. Thankfully, Avian Flu didn't reach the United States this year. All the birds were killed by hurricanes. And who brings up the rear? The Horseman of Famine! This one is the man with the plan, the man working in the backfield for Mother Nature, the man without the relief helicopters: the director of FEMA, Michael Brown! He kept the food, money, and pretty much any major relief out of New Orleans. And President Bush refused aid from most of the known world, knowing PERFECTLY well the US could handle a little hurricane damage! Haha! Everything added to Brown's success, earning him the title of Famine. So here's to 2006, and here's a prayer for the real Apocalypse to come soon. Maybe less people'll die in that.